Summer’s in full swing, but are you truly making the most of it? Creating a vibrant outdoor space can expand the living area of your home, while providing a unique venue for entertaining or relaxation, allowing you to enjoy every free moment to the fullest. From the ultimate sports bar to a zen paradise, the outdoor design possibilities are endless and can be customized to meet your priorities, be it entertaining friends and family or creating the perfect tranquil retreat. As a leader in home comfort for nearly 40 years, Napoleon has extensive expertise in designing products and environments that help create memorable moments that last a lifetime. The company recently enlisted a third-party research firm to help examine the connection people have to different areas of their home and outdoor spaces, and how the design of those spaces can have a direct impact on emotions. 1. Add an outdoor kitchen — Outdoor kitchens are growing in popularity, and for good reason. Not only do they meet a basic need, but they do so in a fun, engaging atmosphere. No one wants to be stuck inside preparing a meal when the party is out under the sun — or stars. 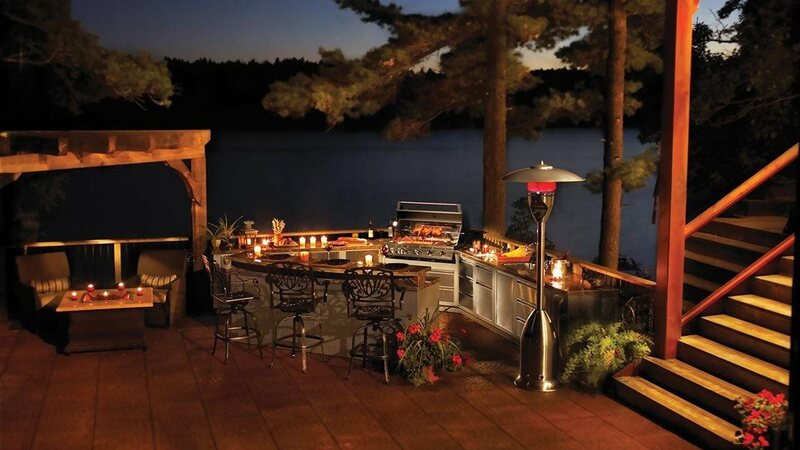 The showpiece of every great outdoor kitchen is a quality, professional grill, which can be freestanding, or built-in to save on space. Napoleon’s Prestige PRO Series grills are packed with features for professional-level grilling right in your own backyard. Innovative products like the OASIS Outdoor Kitchen allow you to personalize your outdoor area with a cooking and storage solution that fits your space and your budget. Other culinary considerations include outdoor refrigerators or beer dispensers to keep beverages cold and flowing freely, pizza ovens and sinks for easy clean-up. 2. Establish a gathering place — One of the most important features of an outdoor space are areas for socialization. A central location with a variety of seating options creates a welcoming atmosphere. Adding the element of fire to a space sparks emotion, provides a focal point, and enables the space to be used later into the season. Consider a built-in fireplace or a fire pit that can be moved to different locations depending on your needs. 3. Create privacy, divided zones — Escape the hustle and bustle while making your space feel more intimate with the use of barriers like large plants or trees, a pergola, or privacy panels. Designing distinct spaces with divided zones helps create the feel of a secluded getaway and gives each area purpose. 4. Design for all the senses — Our favorite spaces are those that delight all the senses. In addition to designing a comfortable, beautiful space, consider adding outdoor speakers for music that sets the mood, or a water feature that eliminates street noise. Relax and enjoy the delicious smell of grilling or the experience of roasting marshmallows over an open flame. Consider adding fragrant bushes to fill the night with a sweet scent. Get creative. 5. Add accents — Small touches can go a long way. Personalize your space with items that define your style and personality or focus on a fun theme. Don’t be afraid to add bold pops of color — your outdoor living area is a great place to explore a more adventurous design than you might consider inside your home. It’s never too late to transform your backyard into a welcoming oasis. For more outdoor design ideas, visit http://napoleonfireplaces.com/inspiration/outdoor-spaces.